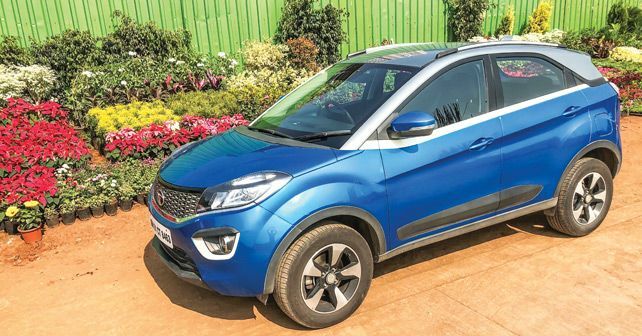 Last month, we spoke about how the Tata Nexon behaves on the highway. While it has been a great highway runner, it has been equally good in the city too. It is the availability of torque in the low-range and the well-sorted gearing that really makes it easy to drive the Nexon. There is a slight turbo lag which you eventually get used to. While the torque does half the job for you, the other half is taken care of by the gearing. Due to the construction of new metro lines, traffic in Mumbai is getting worse by the day. Thankfully though, the Nexon doesn’t demand too many gear shifts in traffic. At really low speeds I can stay in second and in moderate traffic conditions even third or fourth. It’s amazing how Diesel engines are evolving with time. The Nexon is a great example. The 1.5-litre motor is a lot less noisy than the Tatas of the past. In fact, although you can hear the clatter in the outside, the cabin is well isolated from the noise. Tata has also done a good job with the infotainment system. While the sound from the 6 speakers is good, the touch screen responsiveness could have been better. The in-built voice command system fails to decode your instructions - especially when making calls. While the Nexon has a few rough edges, it recently scored a 5-star rating in the Global NCAP crash test. Kudos team Tata, for building the first Indian car to get a perfect score!